They left their homes as usual to seek for their daily bread, little did they know it will be their last try. Shops at No. 14 Adak Uko Street by the popular Mbukpa market in Calabar South LGA of Cross River State opened on Monday night and it was business as usual. But something tragic happened and two people were left dead. The deceased are a shop owner and an 18-year-old Cross River State University of Technology (CRUTECH) student. An electricity transmitting wire sparked and fell on the zinc made roof of a container-turned-shop. The student, was also running away from the scene of the incident sadly made body contact with the electrocuted shop owner and equally died. Husband of the shop owner suffered shock when he was informed of her death and was revived after he tried in vain to rescue his wife. 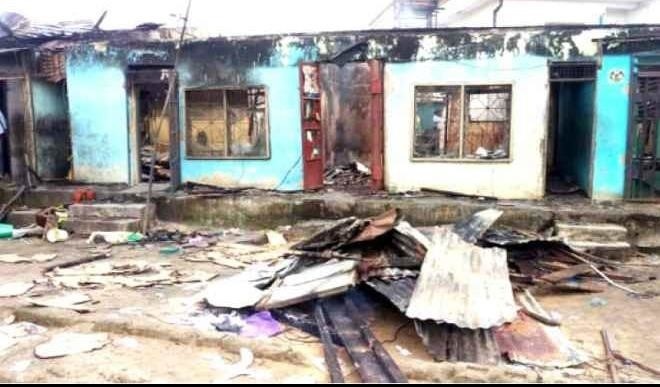 A nearby 19-room bungalow and a patent medicine store were razed but the store owner and tenants escaped unhurt while their property was destroyed. Police officials have cordoned off the scene of the incident while investigation has begun to uncover the sudden drop of the power wire.